"You're never going to like one of my damn records if you only listen to it once." The day has finally arrived. We've updated the news on the main page. 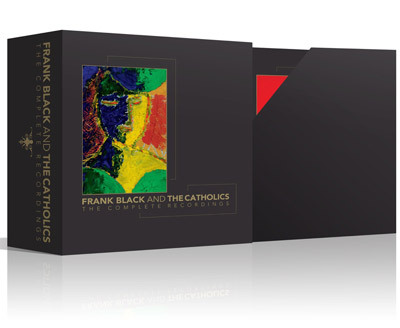 Oh, and it's official: There will be a Frank Black & The Catholics Boxset! At the time of posting this news, there are approximately 100 of a total 200 limited edition boxsets remaining which come with a signed Charlotte (the coverart, done by FB) print. Moreover, when you pre-order you get access to some other gems including FB comments on various songs and a few exclusive streaming tracks. If you don't know which FB song tells the story of Spanish colonization in California, head on over to Pledge Music's page and get yourself a copy, find out the answer, and then listen to a rocking live version of that song. On March 23rd, 2015 Frank Black And The Catholics release the complete recordings box set on Cooking Vinyl. The 7-CD box features all of the band’s 6 studio albums plus a bonus CD entitled "True Blue" which is filled with songs that, according to Ben Mumphrey, "were recorded with the intention of being demos, to be sent to the Catholics band to learn before they traveled to Los Angeles to record the album Black Letter Days. We recorded in the temporarily empty 'B' room in Sound City Studios in Los Angeles, where many of Mr.Black’s local musician friends came by to help out. In return, exquisite evening buffets were provided for all, which Frank Black himself brought to the studio nightly and spread out. Everyone played, ate, talked, and was merry." All six formally released albums (self-titled , Pistolero , Dog in the Sand , Black Letter Days , Devil’s Workshop  & Show Me Your Tears ) have been re-mastered from the original live 2-track and 1-track recordings. The release contains well over a hundred songs. True Blue is a disc of “technical demos” that Ben Mumphrey (who engineered all of the mobile recordings) found in his New Orleans recording archive. The box set will have the songs in alphabetical order as opposed to presented in album format. Frank Black (or as the kids are calling him once again, Black Francis) explains, "[Alphabetizing the songs] feels like an approximation of randomness and it's a way to randomize something, especially if it's [arranged by] titles... We get away from the preciousness of LPs we put out and it's more about the body of work, the good times that we had." See a video of FB talking about the boxset (including artwork) here.